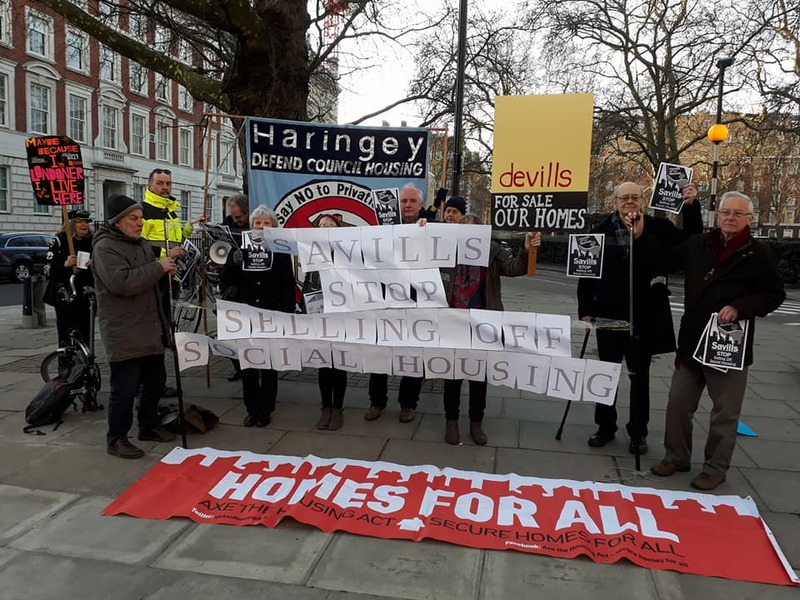 Housing workers from Unite LE1111 joined London tenants this morning to protest at an auction where £7.2 million social homes were due to be sold. Our branch has campaigned against the net loss of social housing that housing associations are now responsible for; the Chartered Institute of Housing calculate that 46,972 housing association properties at social rent have been lost since 2012, mainly because they were converted to more expensive “affordable rent” properties or sold off. The same housing associations that derecognise unions and cut staffing are also alienating residents and anyone concerned at the deepening housing crisis. The paper also quoted tenant experiences. Judi Wilson, who lives in a Genesis flat in Brent, said the flat below her was sold at auction a few years back and was now used as an Airbnb rental. “There is a constant turnover of guests, some of whom have held wild parties,” she said. The recent branch submission to the Labour Party review of social housing policy called for a commitment to a mass programme of council house building, an end to deregulation and financialisation of housing associations, and more resources to address the homelessness emergency along with sustainable funding for supported housing.